Analysis of the LISA Pathfinder mission results (red line, bottom) compared with the initial requirements (top, wedge-shaped area) and that of the future gravitational wave detection mission LISA (middle, striped area), show that it far exceeded expectations. At the heart of the LISA Pathfinder spacecraft, two identical, 2 kg, 46 mm gold–platinum cubes were falling freely through space under the influence of gravity alone. 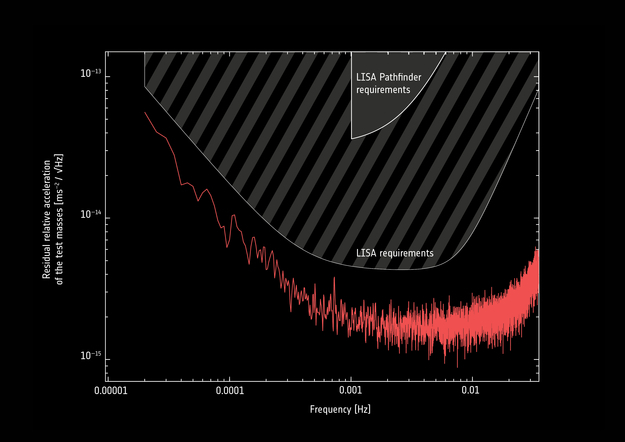 The LISA Pathfinder team measured the remaining forces acting on the test masses, and identified the main sources of noise, depending on the frequency, as shown by the red line.